Have you practiced putting God’s word into practice? 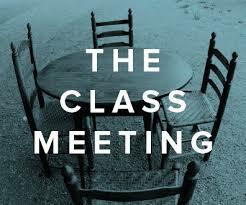 You are invited to join in to learn all about connecting with others, inviting people and expanding your circle of faith by participating in “The Class Meeting” gatherings. Have you talked recently about the state of your soul? Have you been a part of a group that’s sole purpose is to check in on one another’s soul? The key purpose for this study/experiment is to help you grow into holiness of heart and life. Basically this means, to help you become more like Jesus, with a perfect love of God. Have you been a part of a group that invigorates your faith so much, that you just can’t help yourself, but to share with others what the Holy Spirit is doing in your life? The books are available on Sundays in the Narthex as well as at the church office for $13 each. There will be groups on Sunday Morning at 9:45 am as well as during the evenings other days of the week as needed. Please contact the church office to get registered and let us know which time you prefer: Sunday or another time! As groups are formed we will update this page to keep you posted. Thanks again for considering this and know this challenge is coming directly from our Pastors.